As you noticed I&apos;ve been posting random pics from my collection! Work is crazy busy – and will be till we leave for mumbai in ten days. A short, one week visit for a family wedding, followed by a week touring the austrian and swiss alps. I think I&apos;ll go on a mango diet in mumbai Anyone want to go mango shopping to crawford market? Every summer, after I&apos;ve had my fill of mangoes, my eyes search for the butta wallah. Maize (or corn) roasted on an open charcoal shekdi (grill); then liberally smeared with a halved lemon, dabbed in salt and red-pepper powder! The butta season peaks as the monsoon starts, causing folks to huddle by the warmth of the shekdi. One of my favorites here too. Weather permitting, I roast corn on the gas-fired grill. My local friends have never encountered this confluence of zing and zang on their corn, but are quickly converted. 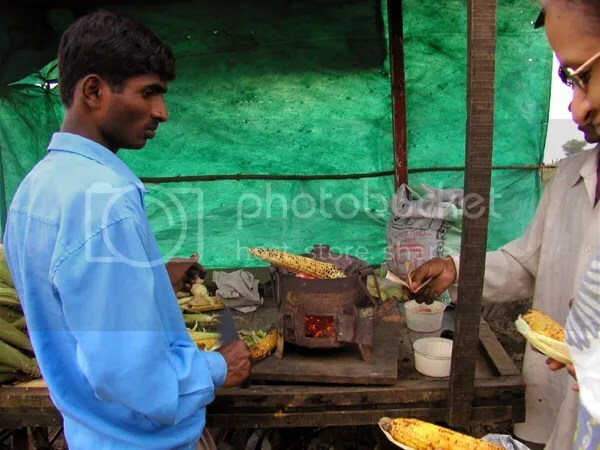 And as at the butta wallah, roasted corn is best served on the husk!